Travelling by train in Japan is very easy and convenient, but prices for train tickets can be quite high. A train ticket on the shinkansen from Tokyo to Kyoto costs about 14.000 yen. 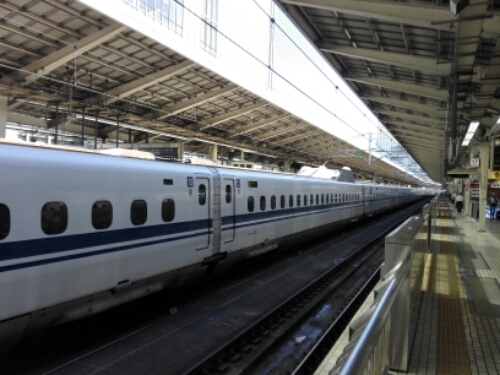 Extensive train travels in Japan can therefore put a big dent in your travel budget. Luckily, for visitors from abroad there is a cheaper option. Japan Rail Pass. 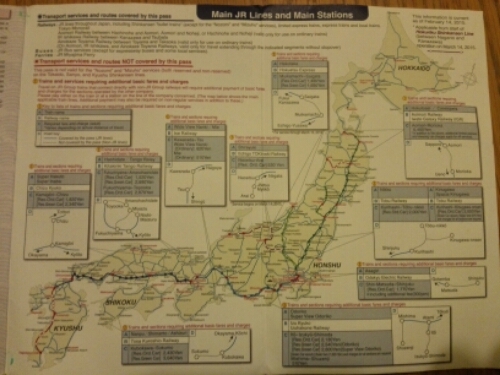 With a Japan Rail Pass you are entitled to almost unlimited travel on all JR lines. Japan Rail Pass is availiable for foreign tourists visiting Japan, and can be bought for one, two or three weeks. The pass gives the holder, with some exeptions, free rides on all JR trains. The price for a week starts at around 30.000 yen and each consecutive week costs about 15.000 yen. For tourists planning on travelling a lot in Japan, the Rail Pass can be a smart option. The price for a week’s pass is equal to a return ticket from Tokyo to Kyoto. My Japan Rail Pass came to good use on my trip in July 2015, I spent three weeks travelling around the country, never staying more that four nights at any location. With the many train departures in Japan, and unlimited rides, travelling was very easy. I felt I never had to plan anything. Just show up at the train station, decide on a place to go, board the train. I settled into my seat, found the snacks I had bought. Started munching as soon as we left the station. Almost four hours until we reached . As we left Matsuyama, drove through the countryside, I noticed how many of the houses were neglected, a few had collapsed. A lot of houses looked abandoned. A result of Japan’s dwindling population and people moving to the city. Passing clusters of houses, in some cases every other house looked abandoned, neglected. In one place one out of three houses had collapsed, leaving just a ruin. I munched on chips and Japanese cakes. Pancakes with a plum filling. Washed it all down with a beer. As we got closer to the coast again, nearing the bridge to the island of Honshu, we left the countryside, more and more factories were to be seen. Long sprawls of suburbia. We passed the Inland Sea, leaving Shikoku. It got darker outside, harder to see the view. I could only see lights in the distance, and short views of cities as we drove through them. As we neared Okayama I realised we would be running late. The train was late. I have always heard of how trains in Japan are never late, always on time. 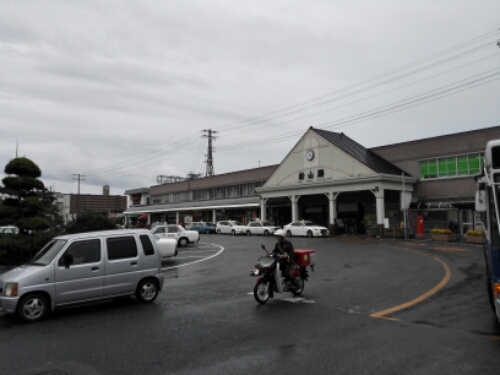 By my clock we reached Okayama Station a full nine minutes late. Now I had experienced a Japanese train being late as well. I smiled as I left the train, headed for Aussie Bar for my last night in Okayama. Japan Rail Pass must be purchased before entering Japan. You will receive a voucher to trade in when entering the country. The voucher can be traded at Narita airport or most major train stations. 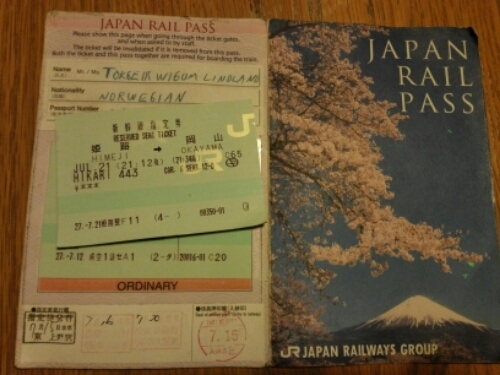 This entry was posted in Japan and tagged Japan Rail Pass, shinkansen, trains, travel on January 1, 2016 by Traveltorgeir.